Once you have a custom widget plugin for Qt Designer, you can provide it with the expected behavior and functionality within Qt Designer's workspace, using custom widget extensions. There are several available types of extensions in Qt Designer. You can use all the extensions following the same pattern, only replacing the respective extension base class. QDesignerTaskMenuExtension is useful for custom widgets while QDesignerContainerExtension is necessary when implementing a custom multi-page container. See also the Task Menu Extension example. See also the Container Extension example. Note: It is not possible to add custom per-page properties to certain widgets (e.g., QTabWidget) due to the way they are implemented. This limitation will be addressed in future versions of Qt. The usage of QDesignerMemberSheetExtension and QDesignerPropertySheetExtension is more rare, but the classes enables you to manipulate the appearance of class members within Qt Designer's workspace. 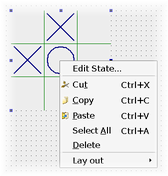 The QDesignerMemberSheetExtension class allows you to manipulate a widget's member functions displayed when connecting signals and slots. 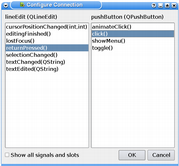 These extension classes allow you to manipulate a widget's properties displayed in Qt Designer's property editor. The QDesignerScriptExtension class allows you to define script snippets that are executed when a form is loaded. 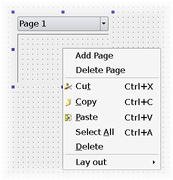 The extension is primarily intended to be used to set up the internal states of custom widgets. 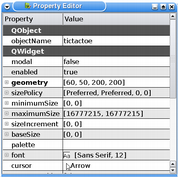 Qt Designer uses the QDesignerPropertySheetExtension and the QDesignerMemberSheetExtension classes to feed its property and signal and slot editors. Whenever a widget is selected in its workspace, Qt Designer will query for the widget's property sheet extension, and whenever a connection between two widgets is requested, Qt Designer will query for the widgets' member sheet extensions. Warning: All widgets have default property and member sheets. But if you implement custom property sheet or member sheet extensions, these extensions will override the default sheets. This enables Qt Designer to use the qobject_cast() function to query for supported interfaces using nothing but a QObject pointer. In Qt Designer the extensions are not created until they are required. For that reason, when implementing extensions, you must subclass QExtensionFactory to create a class that is able to make instances of your extensions. In addition you must register your factory with Qt Designer's extension manager; the extension manager controls the construction of extensions as they are required. 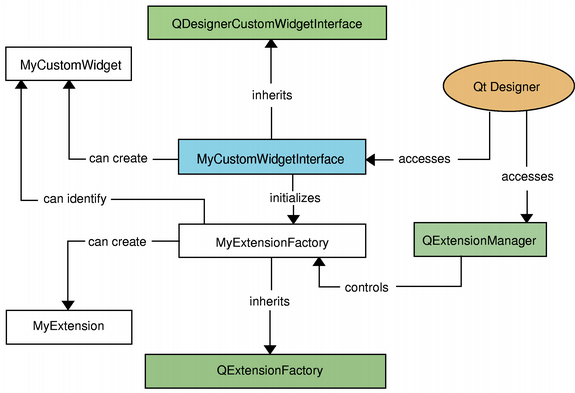 When an extension is requested, Qt Designer's extension manager will run through all its registered factories calling QExtensionFactory::createExtension() for each until it finds one that is able to create the requested extension for the selected widget. This factory will then make an instance of the extension. The QExtensionFactory class provides a standard extension factory, but can also be used as an interface for custom extension factories. The purpose is to reimplement the QExtensionFactory::createExtension() function, making it able to create your extension, such as a MultiPageWidget container extension. The formEditor parameter in the QDesignerCustomWidgetInterface::initialize() function is a pointer to Qt Designer's current QDesignerFormEditorInterface object. You must use the QDesignerFormEditorInterface::extensionManager() function to retrieve an interface to Qt Designer's extension manager. Then you use the QExtensionManager::registerExtensions() function to register your custom extension factory. Please see the Task Menu Extension and Container Extension examples for more information about creating custom widget extensions in Qt Designer.